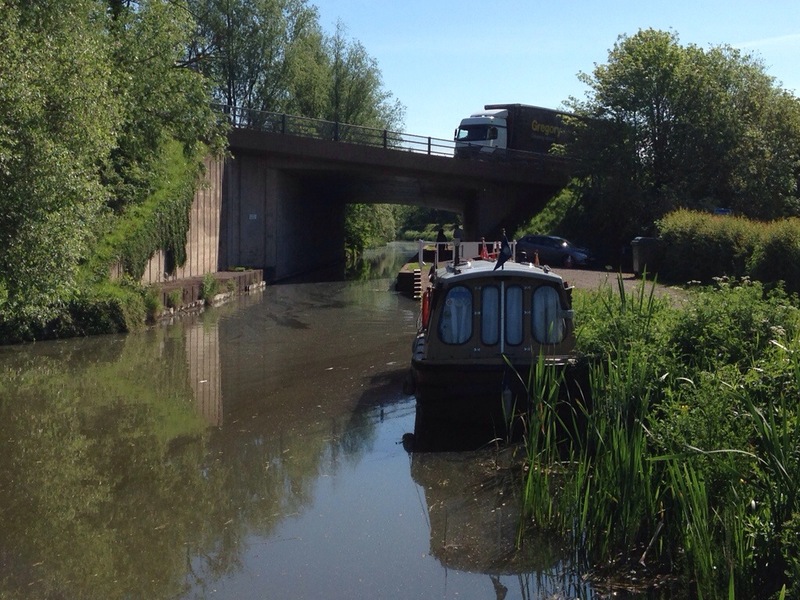 Sloe, Snapdragon and Tophyl are on Grand Western canal in glorious Devon to help with preparations for the Grand Western 200 and IWA National Trailboat Festival which take place along the canal over the forthcoming Whitsun bank holiday weekend. 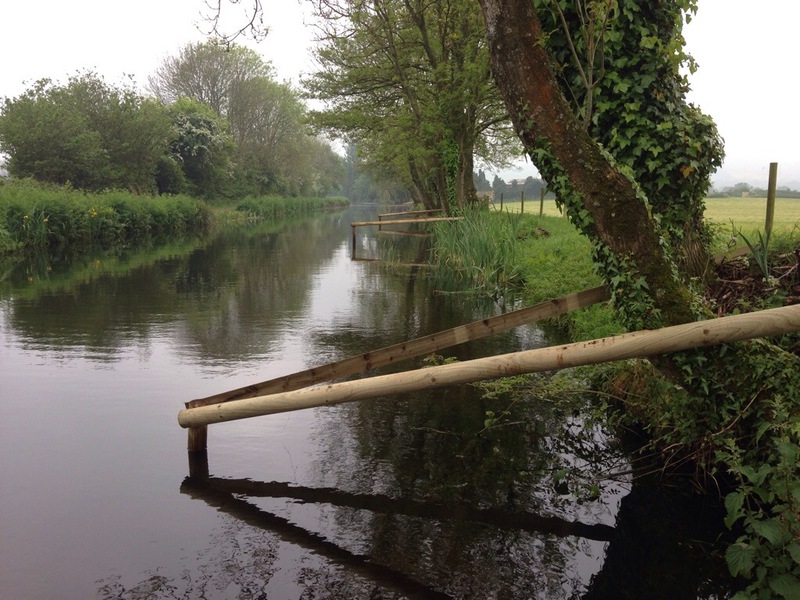 This beautiful flora and fauna rich canal, which suffered a catastrophic failure of an embankment near Halberton in the winter of 2012, celebrated its full repair and reopening earlier this year. 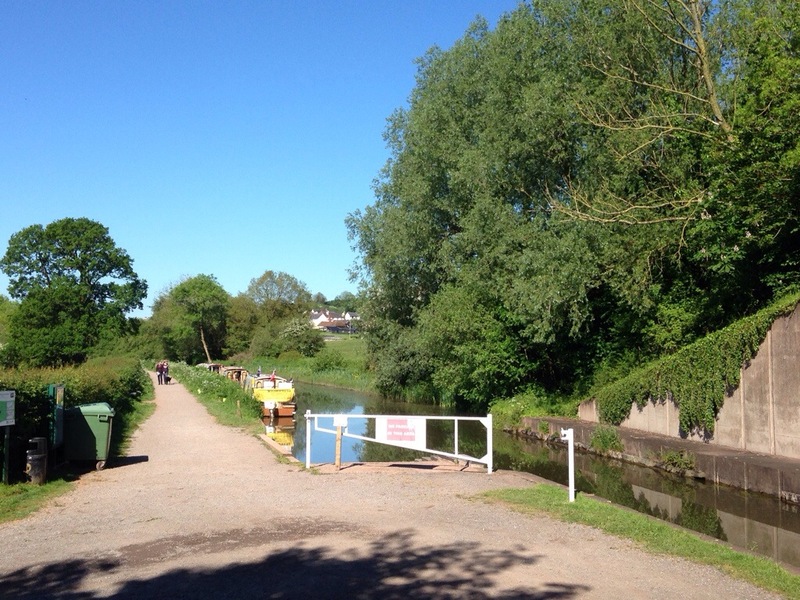 Full credit must be given to Devon County Council who funded the repair and who fund the Ranger service and to the Canal Ranger service itself, who maintain this isolated canal and linear park to an excellent level. Plans for the work that needed to be done had been ably drawn up by the crew of Sloe and so whilst Snapdragon waited for the arrival of another boat, Sloe and Tophyl headed to the Mid-Devon show ground to erect resting barriers for the boats, like Wilderness that can moor nose in, to rest against. 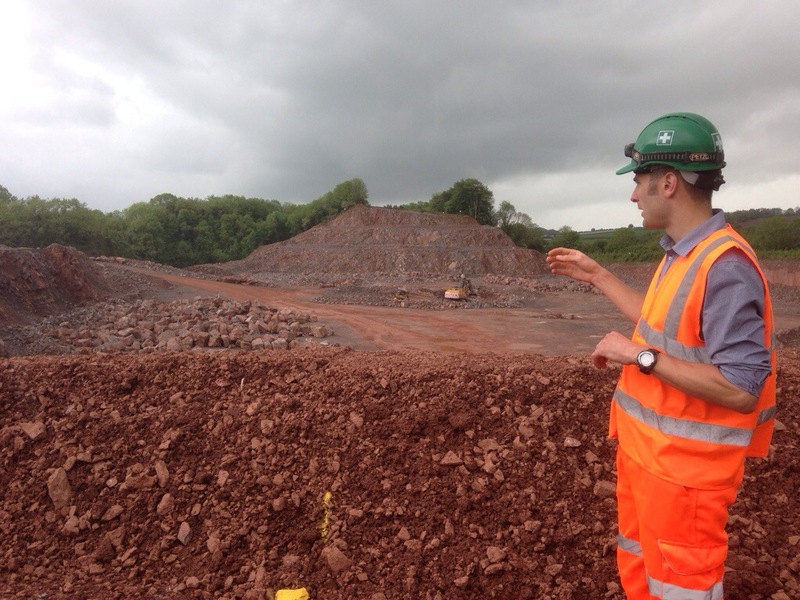 Once completed it was time to put out some cones in the adjacent Tiverton road car park in advance of the arrival of a Sea Otter, which is due to be craned in at 7am tomorrow morning. This Sea Otter had come directly from an event at Moira. Once this was completed it was time for dinner, which was occasionally interrupted by rain and the odd clap of thunder. Three more boats due to arrive today and Welcome packs to stuff. Time to get about it. 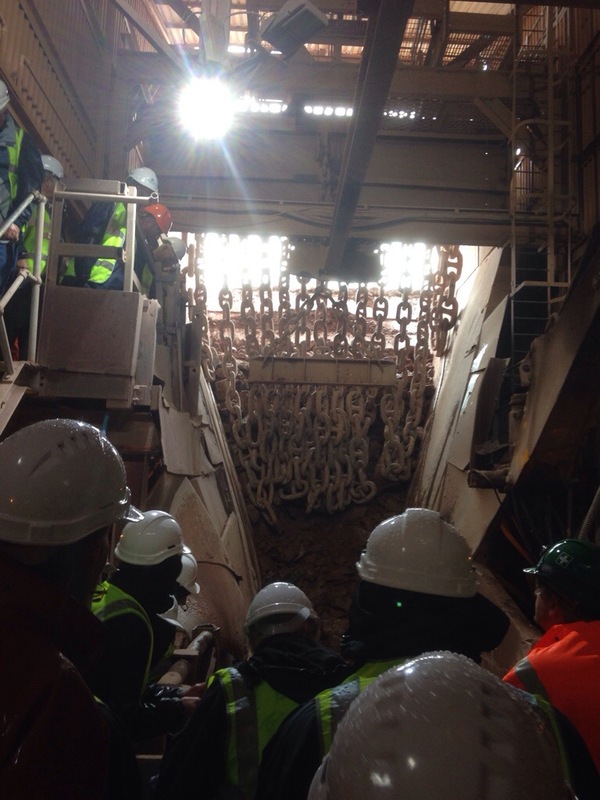 The Sea Otter was successfully craned in using a big HIAB as arranged. 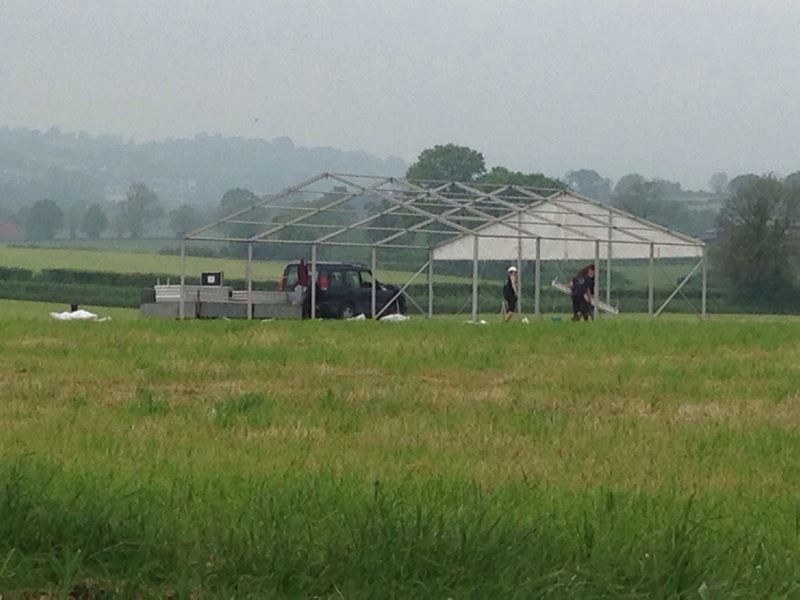 On the show ground site the first marquee is erected. Returning to the slipway we moored up at Greenway bridge and walked down using the new pathway away from the road to Halburton farm shop for supplies. At the same time we also caught a sharp shower, the last of the day as it happened. 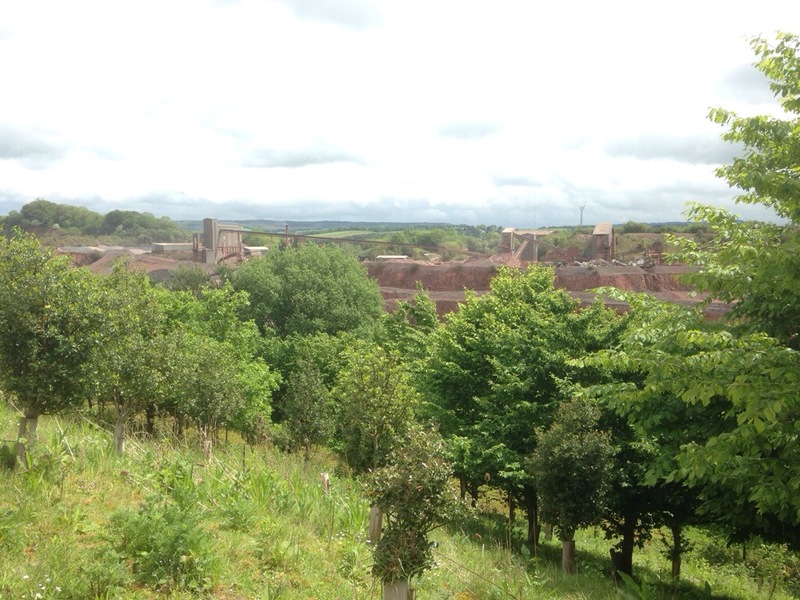 From then on the weather improved and soon the sun was out and the countryside looked stunning. Back at the slipway 2 boats, Mini Me & Tranquility, had arrived all the way from the Bridgwater & Taunton canal as well as Olive from the successful Moria event. 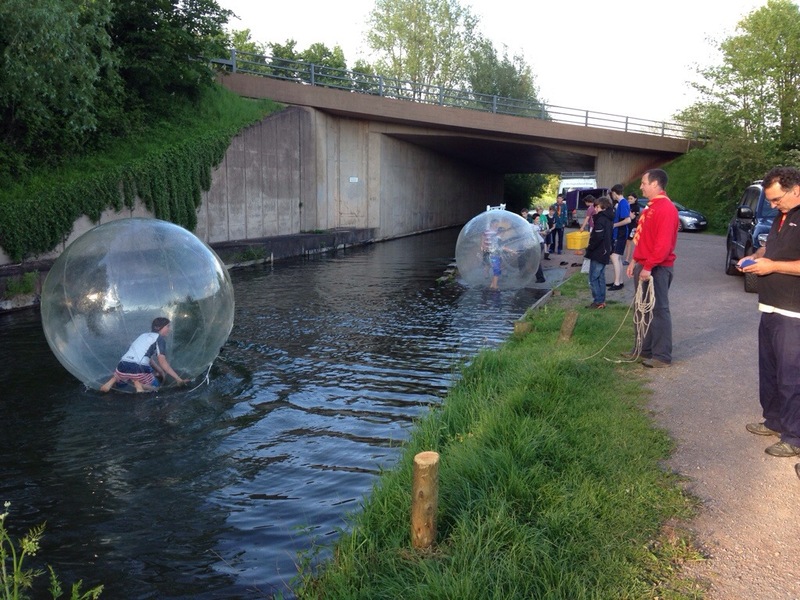 As the evening started the canal was suddenly noisy with the arrival of the Wellington Scouts and 2 inflatable plastic balls. Trying to walk on water seemed the order of the day but without any success but lots of laughter and lots of energy being expended. Great to see youngsters out enjoying themselves and experiencing the great outdoors. The day dawned with a clear blue sky and the birds singing. Three boats due today. It’s tough work on the slipway for the water space team. Time before the first boat is due to wander down to the local farm shop and then the SPAR shop for some provisions and newspapers. The first boat of the day is Marie II, a much travelled boat, which arrives from a holiday on the river Exe including a trip up into Exeter along the Ship canal. She is followed closely by Princesse Estrith from Pewsey. The final arrival is Arwyn, who was towed down from Semington by one of the Water Space team from Snapdragon. As the boat numbers are starting to increase in advance of the festival weekend, it’s good to see early arrivals starting to explore. 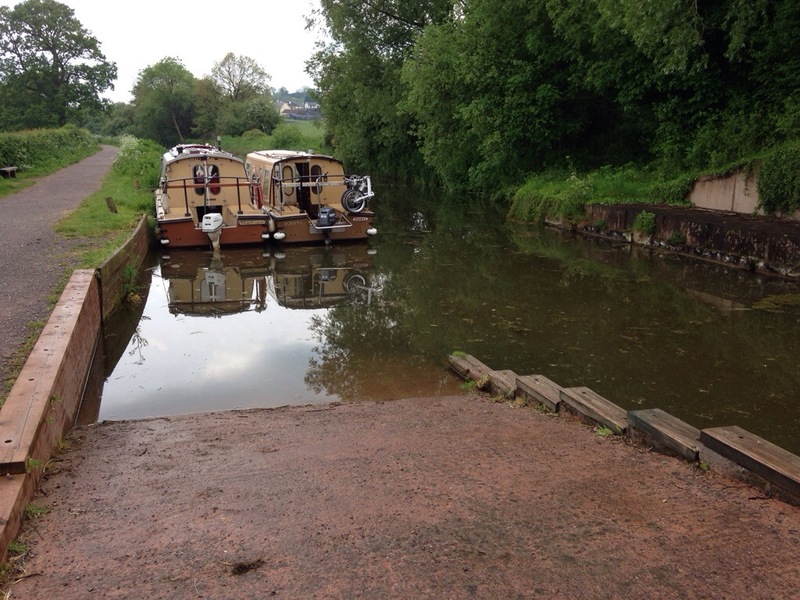 Tranquility (the first Beaver ever made) and Mini Me pass the slipway heading towards the east most end past Burliscombe. The disused Lowdwells lock, a little past past Waytown tunnel, which is the end of the in water section had earlier been visited by a member of Tophyl’s crew but by bike. The day closes with another visit of Wellington Scouts to use their inflatable plastic balls with another group of youngsters, whilst some members of the Water Space team enjoy a BBQ on the towpath as the clouds start to gather for a forecast wet night. 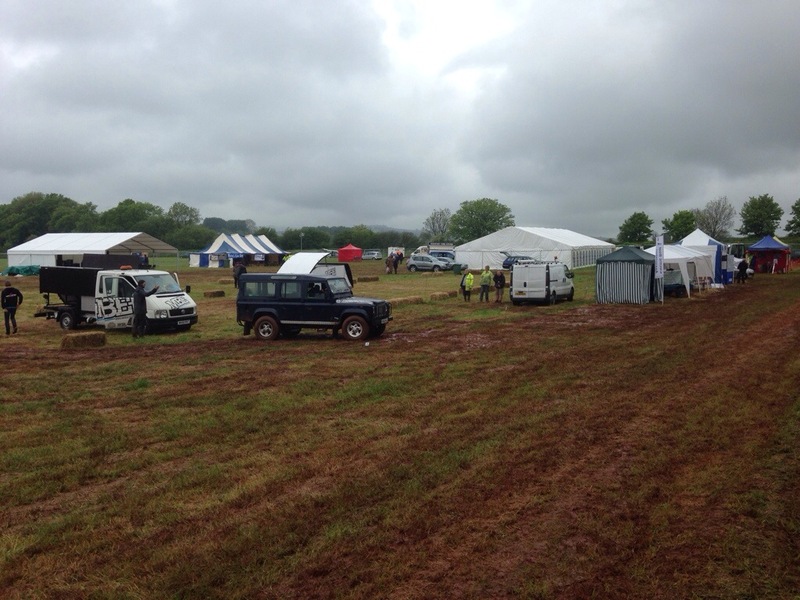 We hear from the Water Space organisers on Sloe, who have returned from the festival planning meeting that the WRGies have arrived on the festival site and have as their first job set out their site and erected their marquee and tents. The day dawns this time to grey clouds, after a wet night. Seven boats due today as the pace of arrivals starts to increase and the weekend draws ever closer. 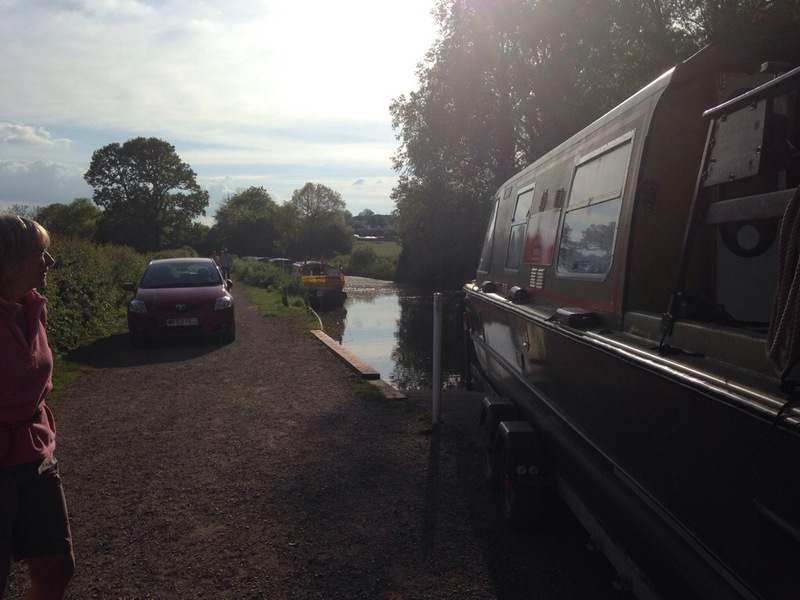 The first problem, a local resident has ignored the signs and parked on the access road to the slipway just as the first two boats The Moodle and Maude Again had phoned in having reached the staging post. A frantic search up and down the towpath found them walking their dog. Once they had left the boats were called in to launch. 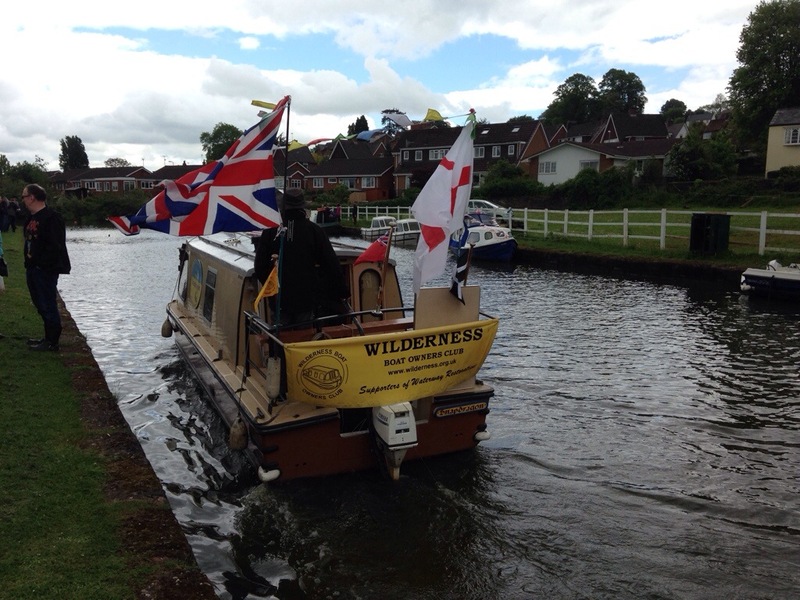 The Moodle is one of the new two piece boats but was fitted out to a high standard by Wilderness Boats at Semington. Next in were Sylvan Dream, a newly purchased Beaver that is presently being converted to be powered by solar panels/batteries. It was accompanied by a battery powered launch Ohm Made. 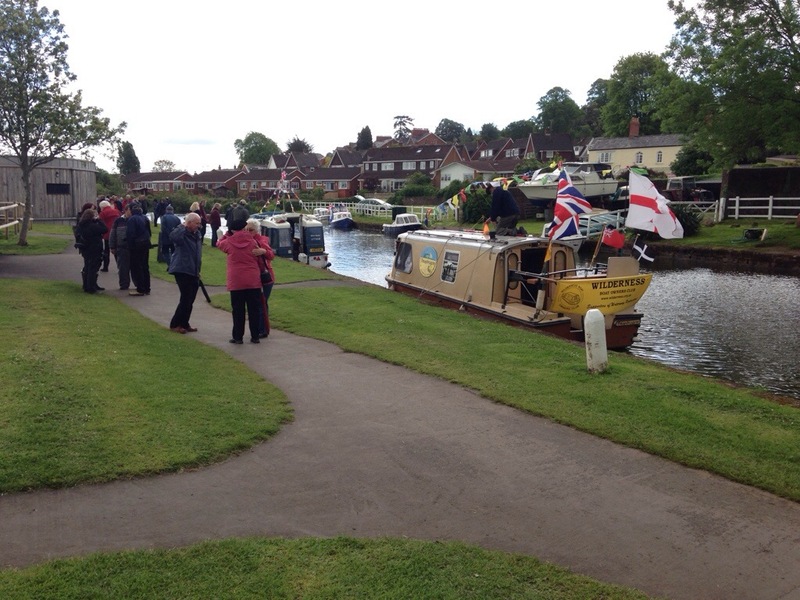 The next boat was Beehive which had travelled down from near London. As it was in the process of launching, it was noted that one wheel was behaving in a peculiar manner and having a funny angle at times. Once launched and as the trailer was being removed from the water, the wheel in question fell off, complete with the brake drum. 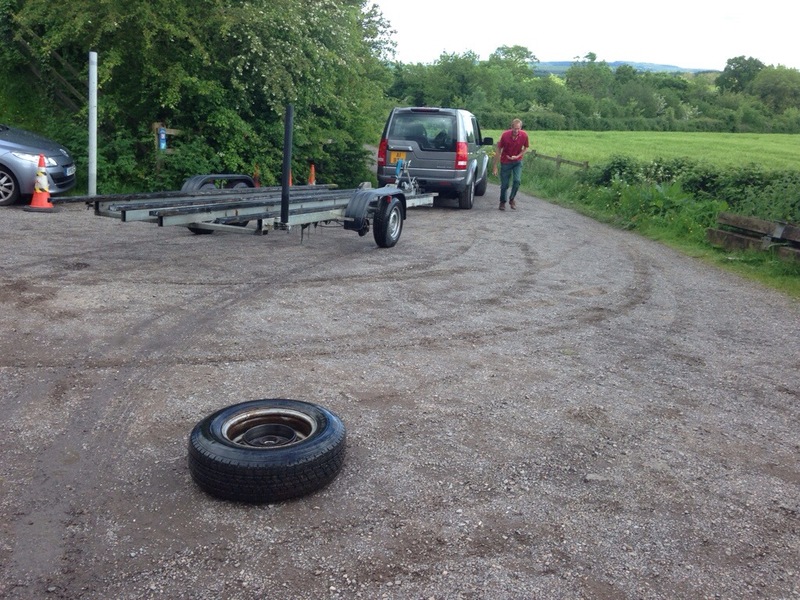 The axles on this trailer are fitted with fully sealed bearings but the wheel bearings and seals had disintegrated en-route. Not something expected of these high quality German sealed for life fittings. 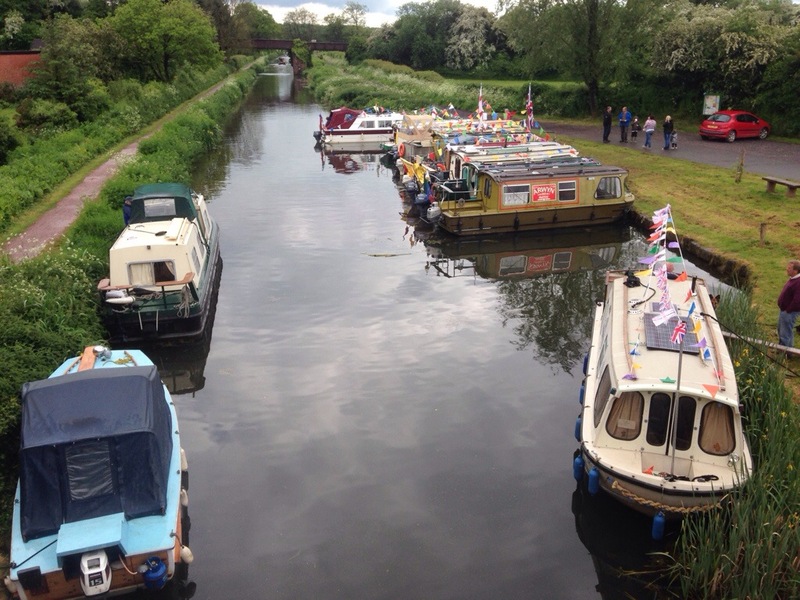 The last three boats were Y Knot, Misty and Puddleduck all based on the Bridgwater and Taunton canal. That actually made a total of eight boats, one arriving a day early. A number of the boaters adjourned to the newly reopened Globe Inn, located adjacent to the canal in Sampford Peverell. Where we enjoyed an evening with good attentive service, good food and pleasant company. Overnight rain gave way to misty rain. During the night Toad Hall had arrived and launched around breakfast time. Only another 9 boats today. 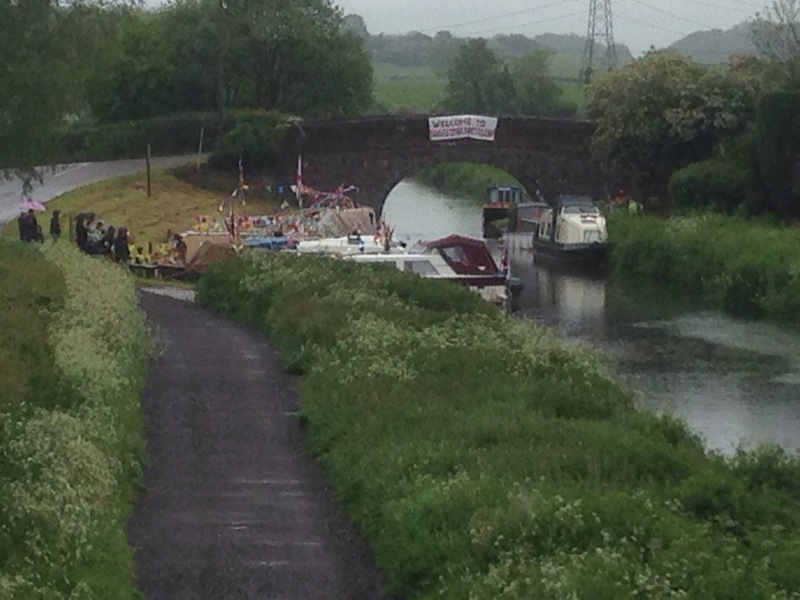 Boaters events start this afternoon near Burlescombe. 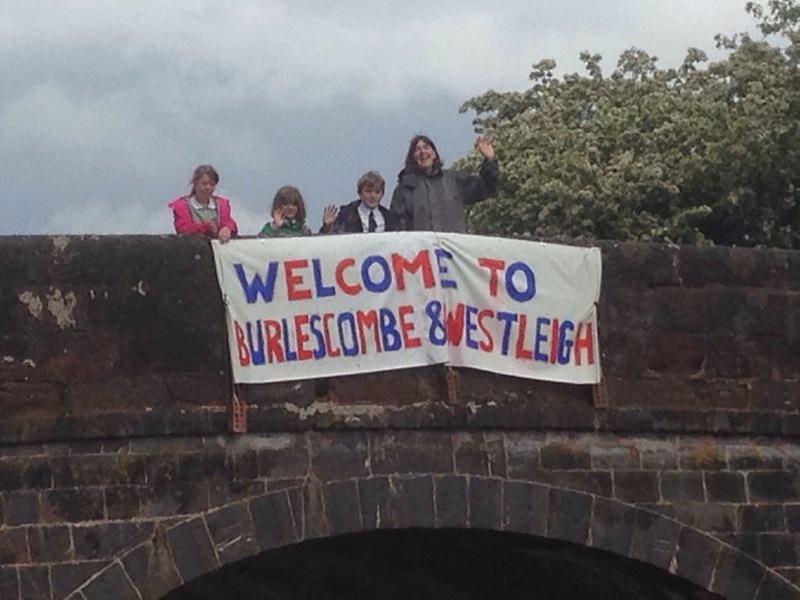 Arrived to a great welcome from Burlescombe and Westleigh. The banner was painted by local school children and a cake stall was erected. The only thing was the weather was not playing fair. 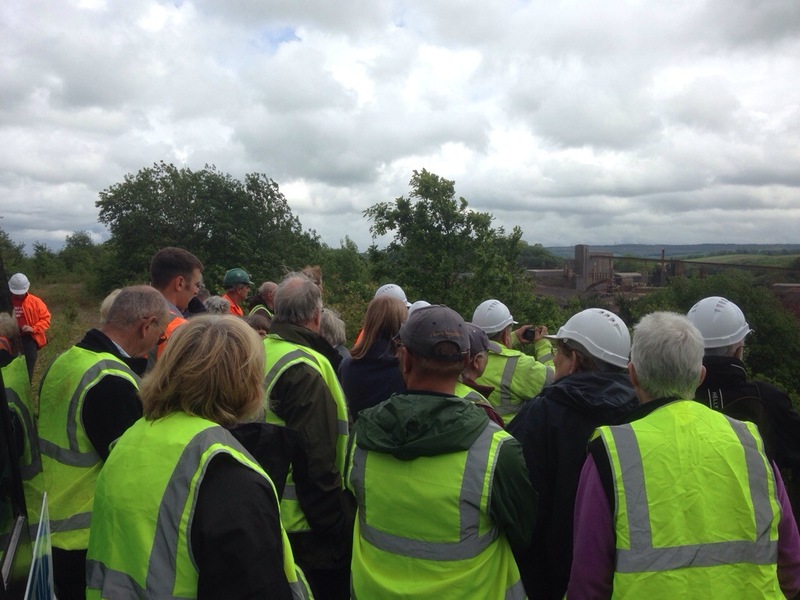 The majority of boaters plus some WRGies were collected by two mini-buses for a very interesting tour of Westleigh quarry. 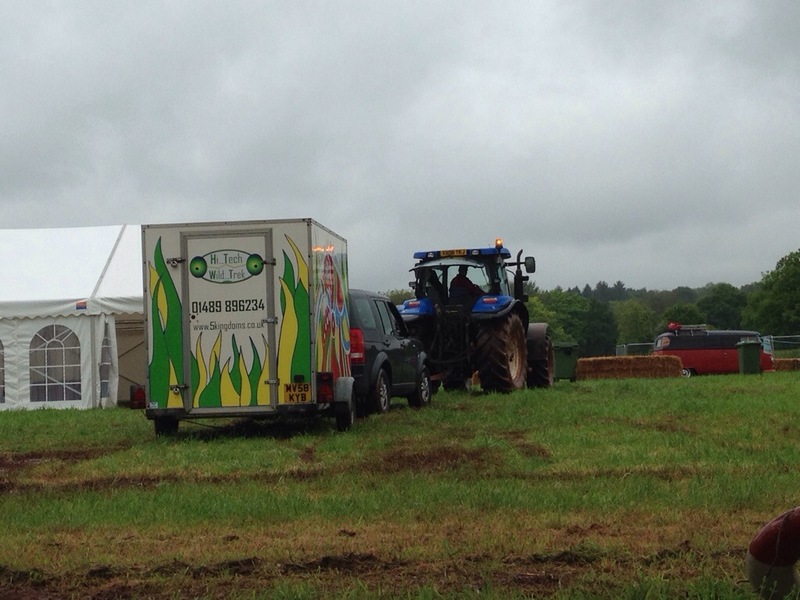 Unfortunately half way around site heavy rain curtailed it. By the time we arrived back at the boats the rain had stopped and some school children arrived for a look at the boats. Also a very welcome sight were the cream teas and cake laid on by the villagers. Very nice they were too. 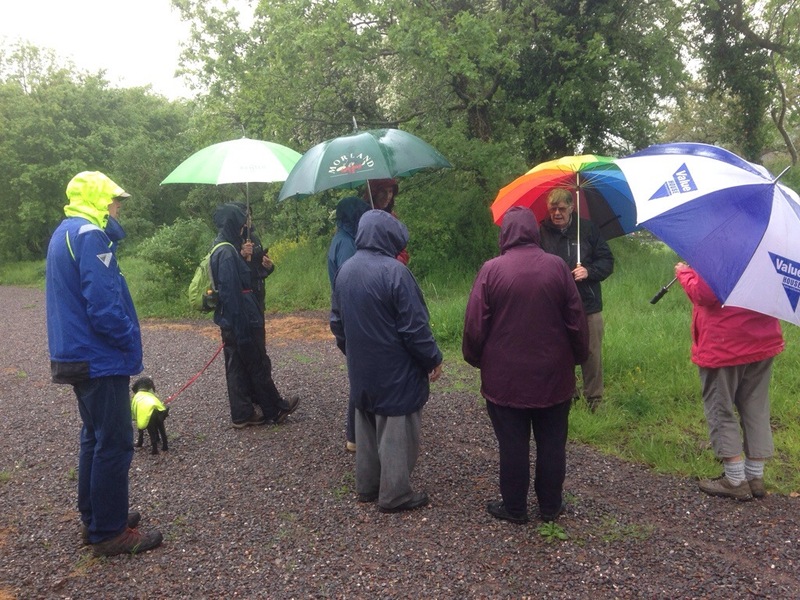 Then started an interesting walk and talk about the local industrial archeology based around the older quarry workings, which also took place in the rain as it had started again. Of course once all these events finished the rain stopped and the sun came out for a cool but pleasant evening. Some boats took the opportunity to move on the location of the next event, the mid-Devon Showground, about 2 hours of so down the canal. A bright start but with threatening clouds. The eight or so boats left at Burlescombe had a reasonably early start to get to the main event at the Mid-Devon Showground for 12 noon. Unfortunately as these boats arrived at the Showground and as the event was starting and visitors were arriving, the heavens opened. This was not just a shower but a prolonged period of heavy rain. By 2.15pm the organisers cancelled the event and the stall holders were told they should leave. Many could only do this with the assistance of tractors to get them away from the site. 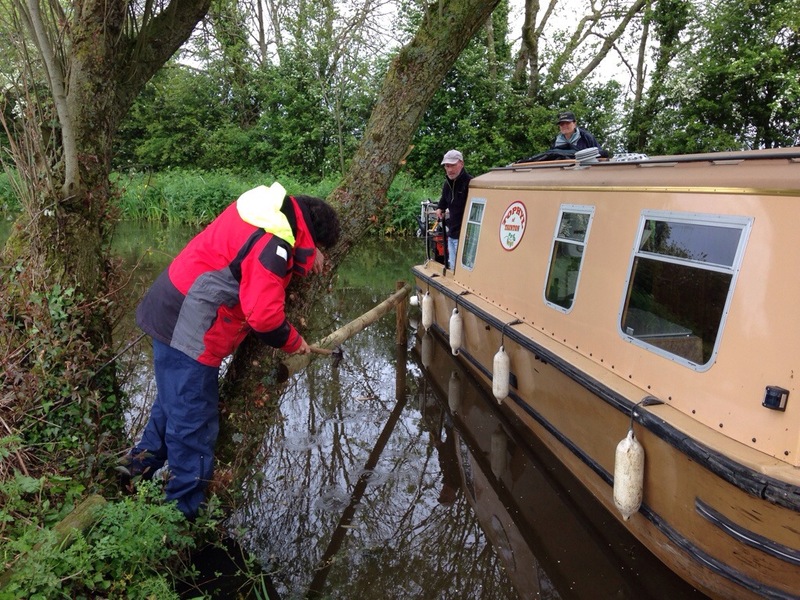 By 4pm the canal level was rising and the Canal Rangers were having to actively manage the water levels as one of their newly installed water level warning alarms had gone off. It is so sad that so much planning had gone into making this a really successful event and today has been washed out. We feel very sorry for the organisational team. 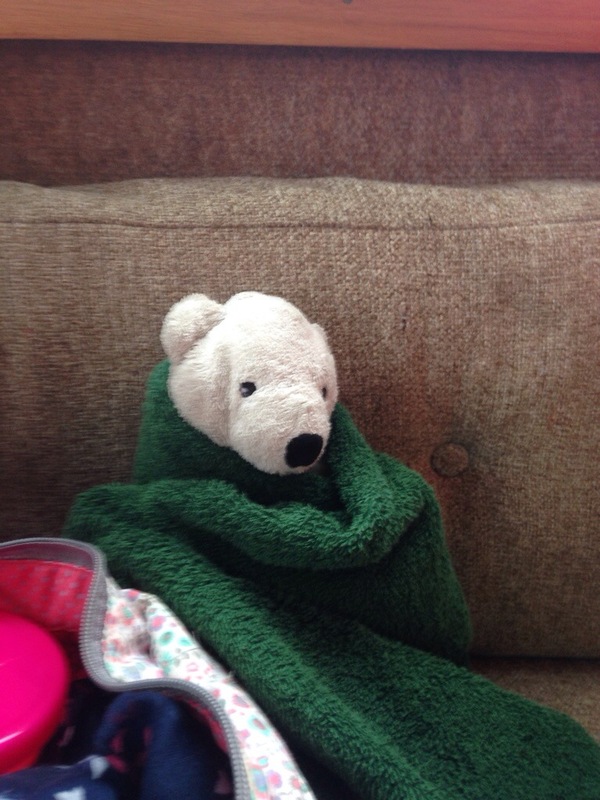 Even Polar Bear, a Grand Daughter’s favourite toy, had to be dried out! 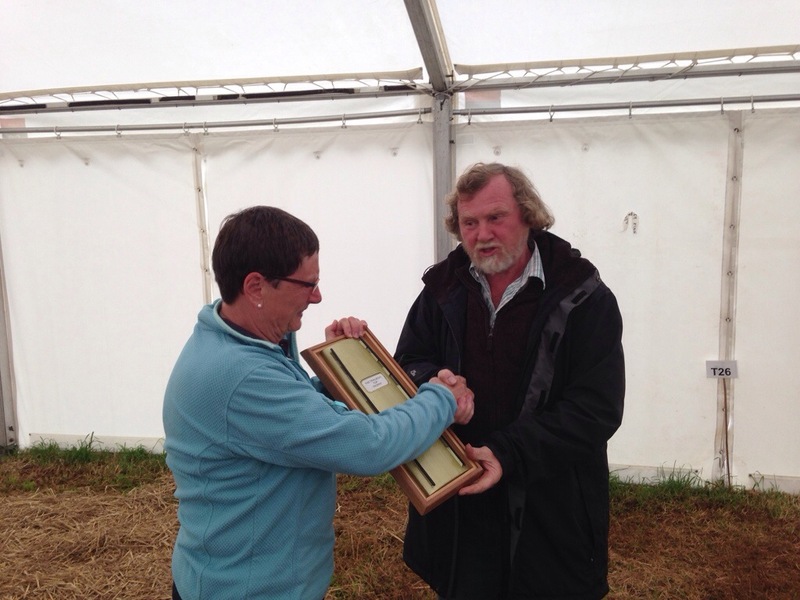 At 5.30pm in a deserted handicrafts marquee we held the WBOC AGM on the Club’s 25th anniversary year. The business of the meeting over, we awarded our Club’ top, bottom and our magazine, Best Illustrated Article awards. The top and bottom awards are actually true scale models of the top and bottom of a Wilderness Otter. 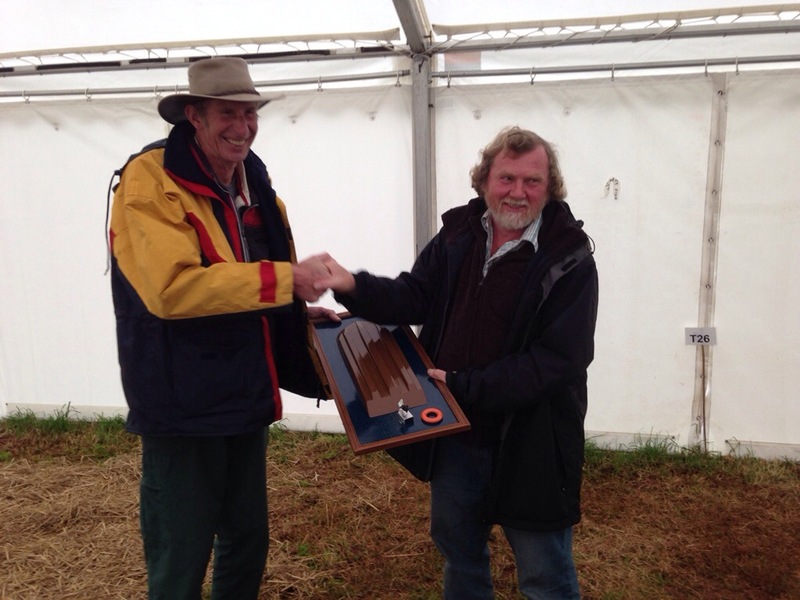 The top is awarded to a person who has done something outstanding for members or others in the boating fraternity. The bottom is awarded to someone who has done something a bit silly but even more they were spotted doing it! 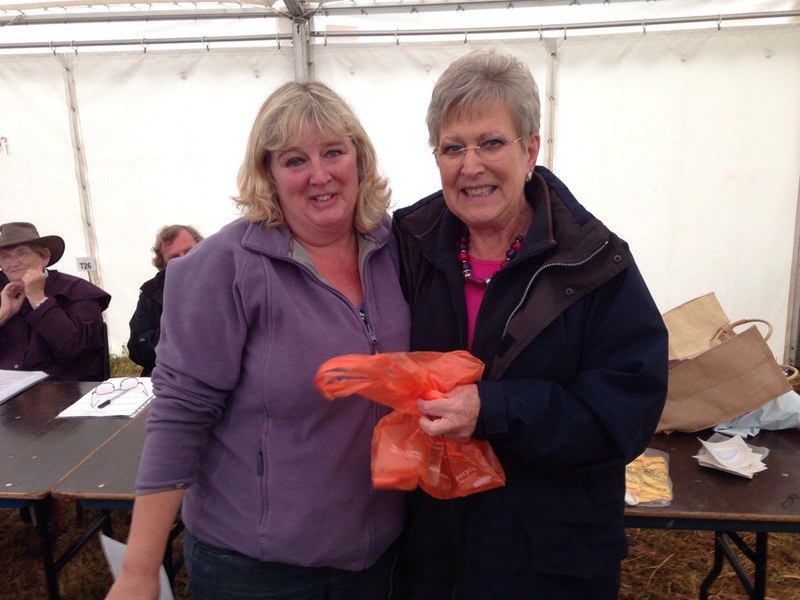 Jane Pilgrim was awarded our Top trophy. John Brice was awarded the bottom trophy. Sandra Parker was awarded the best illustrated article award, which included her daughter going to her wedding on the boat. As the meeting finished there was a toast to Audrey Baker who started WBOC and to the club on its 25th anniversary. Tomorrow is another day and with a better forecast, hopefully the event in Tiverton basin will live up to expectations, culminating with the illuminated boats at 9.30pm. 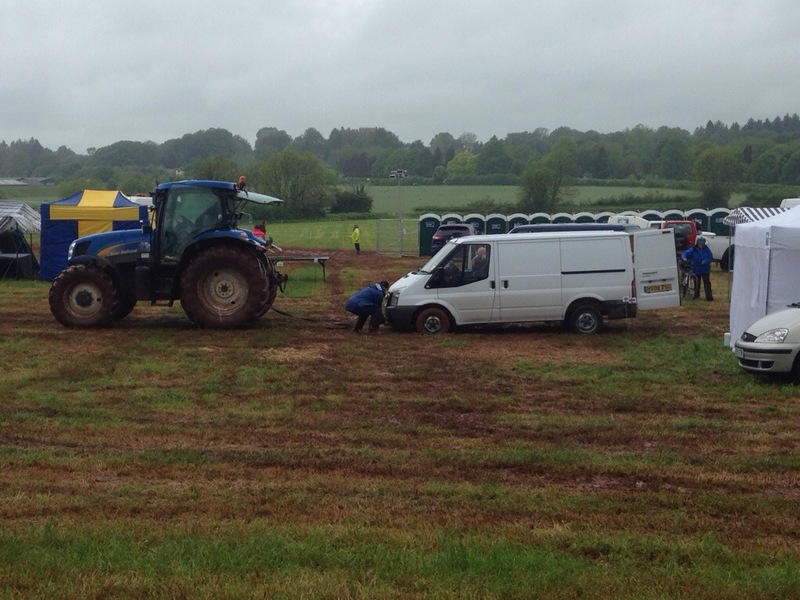 A sad sight was the Showground this morning. Mud, mud and the odd empty marquee and a few people slipping and sliding their way to make use of the facilities to dump loos and rubbish. As boats started to leave for Tiverton basin so the weather bid us farewell with another heavy shower of rain but on the horizon we could see Tiverton in a shaft of sunshine. 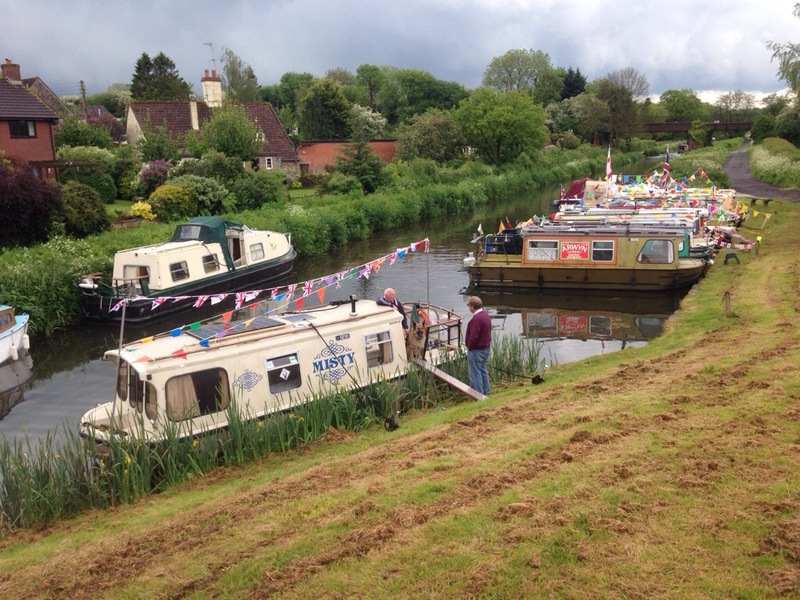 As we arrived in Tiverton basin it was quickly transformed with bunting, boats and people. The afternoon saw the boat handling competition. As this completed boat crews started to put on their lights ready for the illuminated cruise due to start at around 9.30pm. The afternoon celebrations were hotted up by a Samba band and a compare who kept things moving. As the evening drew on, the crowds kept increasing, 2000? 3000? Who knows but they stretched out along the canal. Around 9.15pm the boats left unlit for Tidcombe Lane bridge, where they turned about, turned on their lights and just after 9.30pm they slowly processed back to the basin, past cheering crowds and a hot air balloon lit up against the night sky. A very successful day. Some boaters were up early to get back to Sampford Peverell in advance of the “Navies Fair” being held on the village playing field. 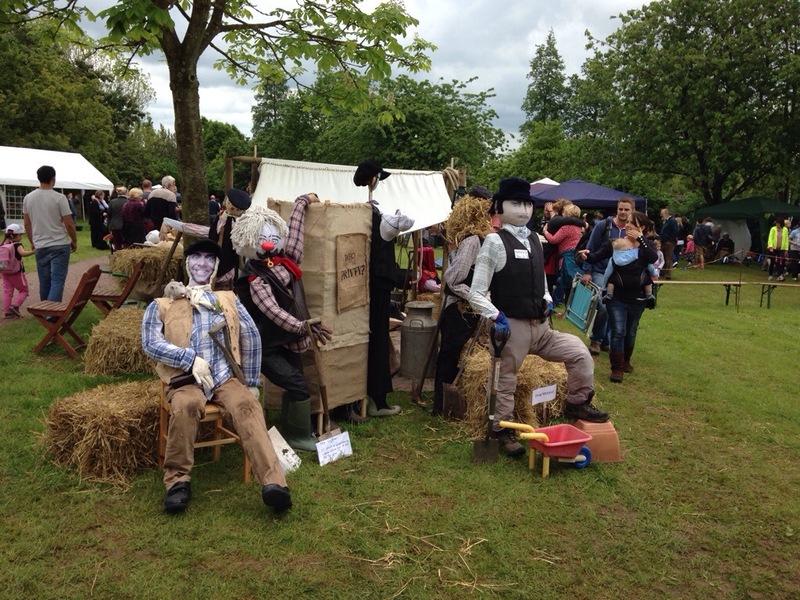 Across the village through out the week leading up to the event visitors could see many dummies made to look like navies, who dug the canal 200 years ago. 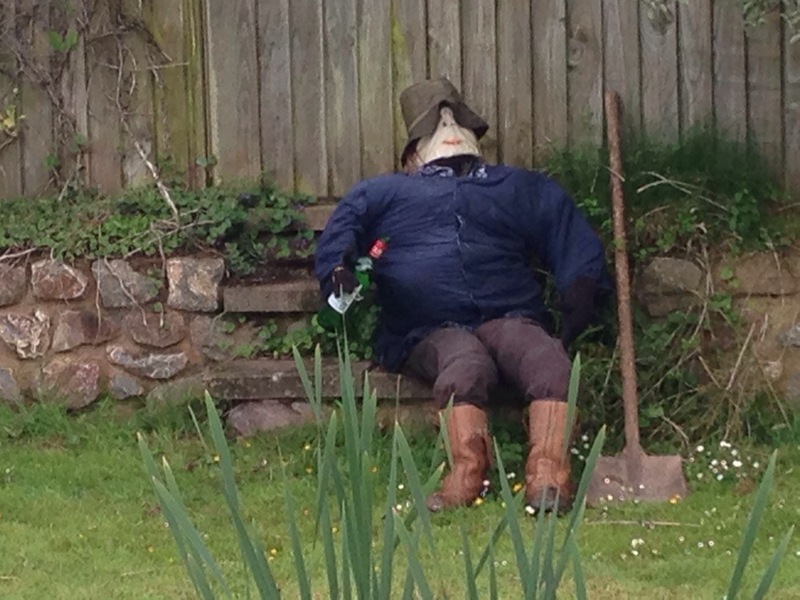 This one has a nice pair of boots and it looks like he has just finished of that bottle of wine. 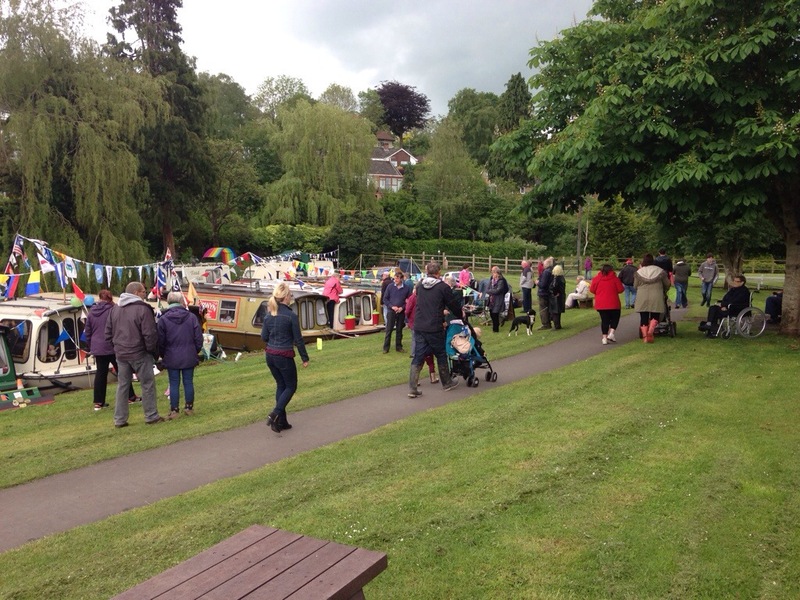 The event was opened by the directors’ barge, which was man hauled along the canal to the fair site. The were greeted by a number of Navies already on the site. 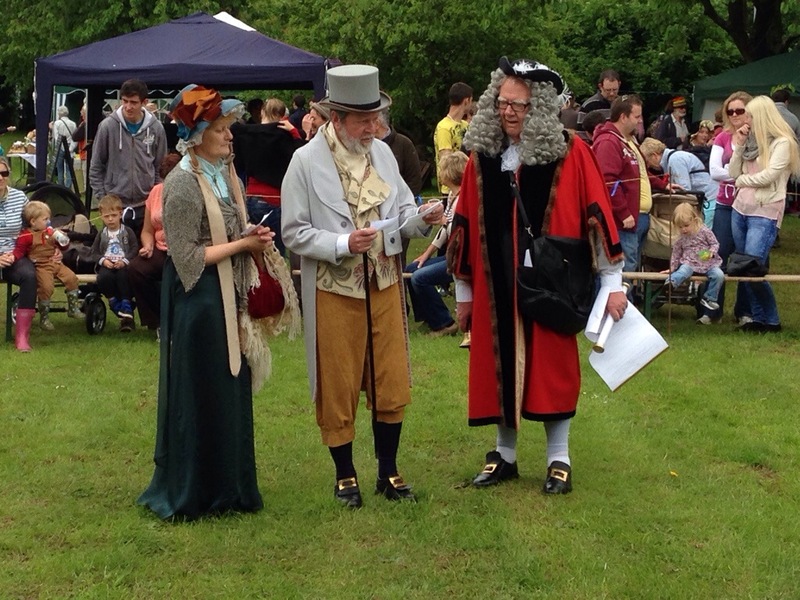 There were a number of competitions for local people and the results of these and announcements of forthcoming events throughout the day were announced by their very own town cryer. Not a loudspeaker in sight and no musak, just a local band who played especially when the children danced around a Maypole. Very nice it was too. 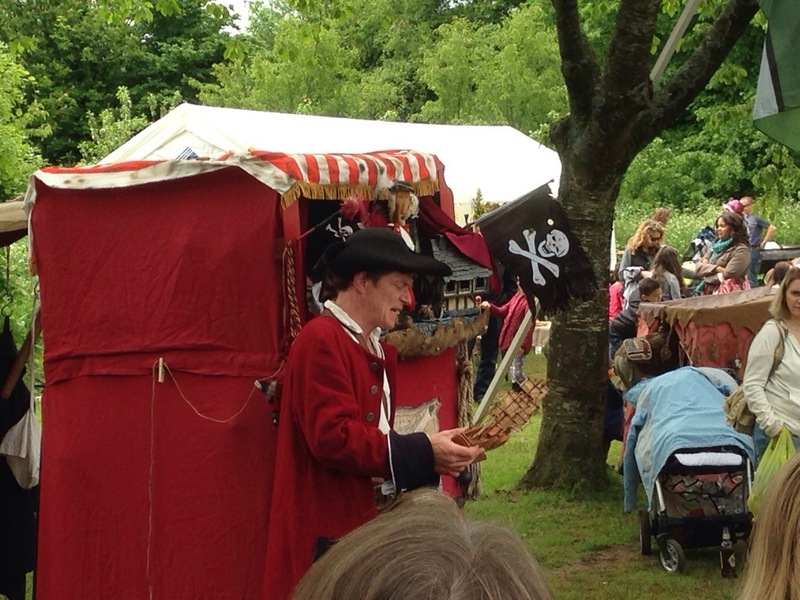 A change from Punch and Judy to amuse the children and adults alike. 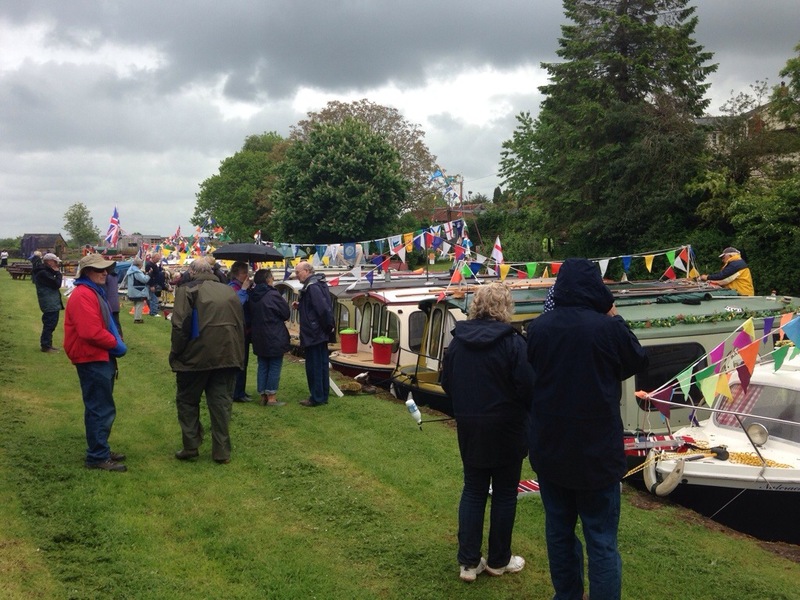 During the event the IWA awards were made and an announcement of the location of next year’s IWA Trailboat Festival and that is a return to Crooklands, on the Northern Reaches of the Lancaster Canal over the weekend of May 30th & 31st, and 1st June 2015. This is NOT the bank holiday weekend. 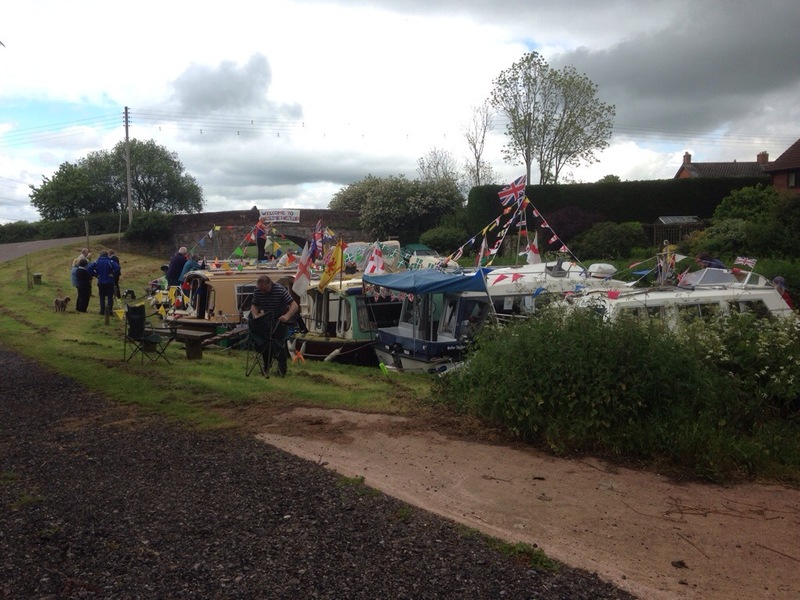 The festivities over so boats start to depart back to where they came from. 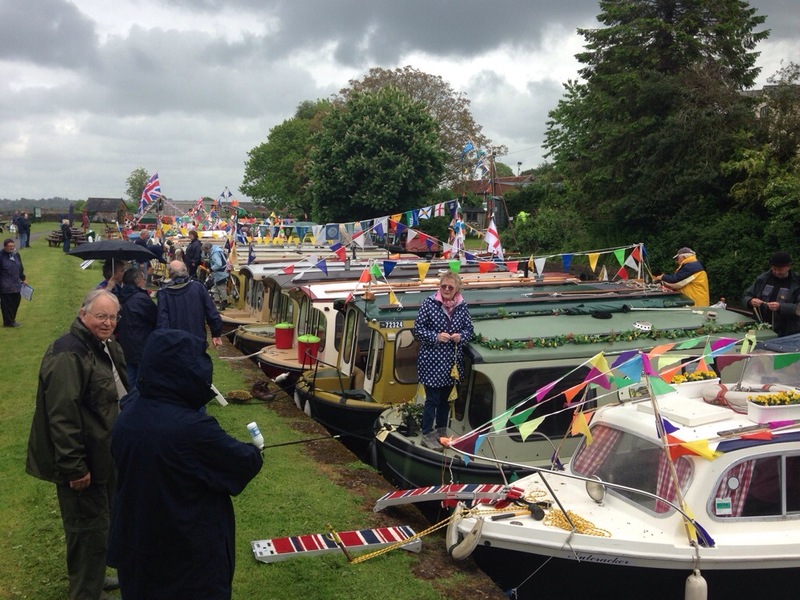 Thank you to all the boaters who came, some a considerable expense over long distances, to visit the Grand Western canal and take part in the event. 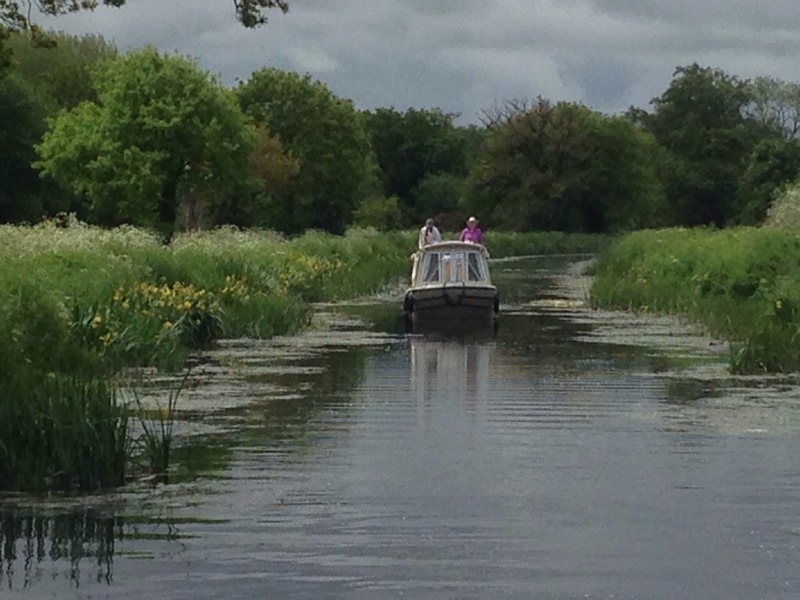 Thank you to the Grand Western canal Rangers and all who planned and helped to put on a memorable event. Such a shame the weather caused problems on the Saturday but the other days made up for it. See you next year?